Are you headed to the NADA Convention & Expo in San Francisco? If you’re a current customer, visit Booth #2301S to check out our newest DMS features and updates. If you’re not a current customer, why not? Consider making 2019 the year when you finally choose to work with a DMS vendor that puts you in the driver’s seat. With Auto/Mate as your partner you get award-winning software and support, freedom to choose which third-party vendors you do business with and freedom to operate without long-term contracts! To schedule a demo at NADA, visit www.automate.com/nada or stop by Booth #2301S. We’ll also be demonstrating our latest new features and updates! 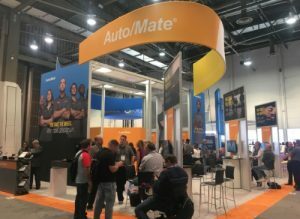 Auto/Mate’s new digital contracting solution allows F&I managers to easily capture signatures, store electronically signed documents and email digital deal jackets to customers. With eDEAL™, customers only have to sign once, then tap to apply their signature to other required fields. The digital deal is then download as a .zip file that can be emailed or put onto a flash drive. The eDEAL™ Signature Capture feature can be used on any mobile tablet and resides in Desk/Mate™, Auto/Mate’s desking module. Because eDEAL™ is native to Auto/Mate’s DMS, all forms are stored as digital PDFs right in the DMS, eliminating the need for physical filing or 3rd-party scanning solutions. Best of all, eDEAL™ offers the same digital contracting functions as competitive solutions at a fraction of the cost! This mobile application enables cashiers, service and parts staff to accept and store electronic signatures from service customers. This allows fixed ops personnel to easily store and manage electronic documents; including ROs, service contracts and parts and service invoices. eSign saves time by eliminating the need to manually store and retrieve paper documents, and the need to scan and upload documents using 3rd-party scanning solutions. With eSign, all documents are stored as PDFs in the DMS and can be emailed to the customer. This increases customer satisfaction, reduces errors and increases dealership compliance, resulting in fewer penalties from factory audits. eSign resides in Auto/Mate’s Parts and Service Merchandising modules, and can be used on the same device as Auto/Mate’s Mobile Service Consultant Module.